Please join us for “Memories + Moments 1968: The Local Civil Rights Movement” on Tuesday, November 13 at 3:30pm in Fenwick Library 2001. 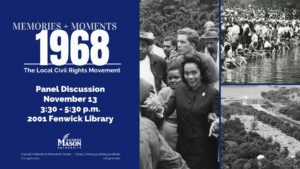 A panel from Mason’s Osher Lifelong Learning Institute (OLLI) – Bob Coffin, Bob Frye, Marguerite Johnson, and Jeremy Remson – will focus on the pivotal year 1968 and share their individual, first-hand experiences at civil rights events in Northern Virginia and the DC area. The panel will be moderated by Zach Schrag, Professor of History, Department of History & Art History at Mason. The event will be recorded and added to our Special Collection Research Center’s (SCRC) Oral History Program collection. Following the panel discussion, all attendees are invited to remain for a reception and visit to SCRC’s current exhibition – Before and Beyond 1968: Three Civil Rights Movements in America. Call & Response, an annual exhibition of collaborations between writers and visual artists, in which ones calls and one responds. The result is a dynamic set of paired works of words and artistic media that resonate and speak to contemporary issues. The theme for the twelfth annual Call & Response is Borders. Call & Response: Borders is on display from Wednesday, October 10 through Sunday, November 25, 2018 in Fenwick Gallery, housed in Fenwick Library on George Mason University’s Fairfax Campus. An opening reception and panel discussion with the artists is scheduled for Wednesday, October 10 from 1:30 – 3 p.m. Reception refreshments provided by Argo Tea Cafe. For more information, visit at http://fenwickgallery.gmu.edu/exhibits/borders. 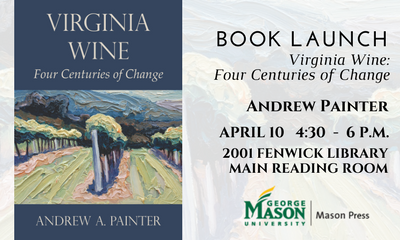 Join us as we launch George Mason University Press‘ new book: Virginia Wine: Four Centuries of Change. No state can claim a longer history of experimenting with and promoting viticulture than Virginia—nor does any state’s history demonstrate a more astounding record of initial failure and ultimate success. Virginia Wine: Four Centuries of Change, a new book written by Andrew Painter and published by George Mason University Press, presents a comprehensive record of the Virginia wine industry, from the earliest Spanish accounts describing Native American vineyards in 1570 through its astonishing rebirth in the modern era. Grape cultivation—for agriculture, horticultural curiosity, and wine production—has absorbed ambitious Virginians since April 1607, when a few casks of European wine washed ashore onto the dunes of Cape Henry in the company of a band of travel-weary English settlers. The author chronicles the dynamic personalities, diverse places, and engrossing personal and political struggles that have established the Old Dominion as one of the nation’s preeminent wine regions. Virginia’s wine industry now accounts for nearly $1 billion in annual sales, with more than 275 wineries growing more than 30 varieties of grapes. Join us to hear Andrew Painter discuss a multitude of wine industry trends, events, secondary industries, and jobs that have revolved around the growing of grapes and the making and promotion of wine. To that end, the book emphasizes the unique aspects of the wine industry’s role in Virginia’s history and culture—a history that continues to be made in an agricultural and industrial sector that is itself unique among world commerce and society. Refreshments courtesy of Mason Bookstore. About the author: Andrew A. Painter is an attorney specializing in land use and zoning. A Virginia native, Andrew has spent more than eight years researching the growth of its wine industry. He is a graduate of the University of Mary Washington, the University of Virginia, and the University of Richmond. For more information, contact John Warren, Director, George Mason University Press and Mason Publishing Group, gmupress@gmu.edu. Join the University Libraries on Thursday, March 22 for the George Mason University Press book launch for Playfair: The True Story of the British Secret Agent Who Changed How We See th e World. The event will take place in the Fenwick Library Main Reading room, from 2 – 3:30 p.m.
William Playfair may be the most famous person you have never heard of. 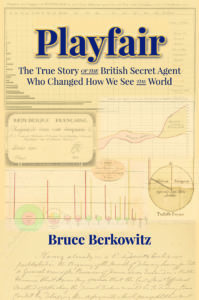 Best known today as the inventor of “statistical graphics”—the line, bar, and pie charts we all use today—Playfair was also a pioneer in strategic analysis, and a secret agent who carried out espionage and subversion against France on behalf of Great Britain. This is the first book to uncover the full, true account of this remarkable, colorful man—undeniably brilliant, hopelessly flawed, and fundamentally important. Its pages reveal the astounding inventions and adventures of this larger-than-life swashbuckler, rogue, genius, and patriot. Books will be available for purchase at the event, and refreshments will be provided. The event is co-sponsored by the University Bookstore. About the Author: Bruce Berkowitz is the author of several books and articles about national security, history, and international relations. About GMU Press: The George Mason University Press supports the academic mission of George Mason University by publishing peer-reviewed, scholarly works of distinction, written by authors from a wide range of intellectual perspectives, for a diverse, worldwide readership. GMU Press publishes in a variety of disciplines with special focus on the history, politics, and culture of Northern Virginia and the wider District of Columbia metropolitan area, as well as other topics such as public policy, international affairs, and higher education.